People of Northern Region are flocking to Mzuzu State Lodge to pay their last respect to the late State President Professor Bingu wa Mutharika since yesterday. The body, which arrived at 9 a.m., was welcomed by the Vice President Khumbo Kachali and a multitude of people who flocked to the Mzuzu Airport. Upon arrival, the body was taken to Mzuzu State Lodge for the viewing ceremony. The day started with a religious ceremony, led by Bishop Joseph Zuza of the Roman Catholic church. Thereafter, the viewing ceremony commenced. Speaking with some Chiefs who gathered at the State Lodge, they said that Mutharika’s sudden death shocked people of North and the entire country. 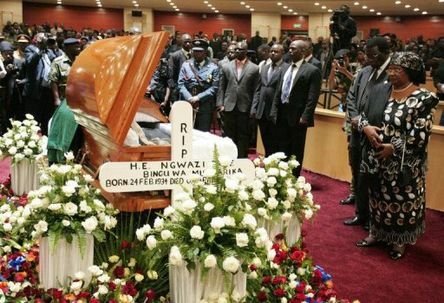 “It is right for me to come here and pay my last respect to the late president as a chief representing my people, who could not attend due to the long distance. Mutharika has left history to the people of Karonga, especially the Karonga Chitipa road construction. I also thank Malawians for their unity since the death of Mutharika,” Karonga’s senior chief said. Inkosi ya Makosi Mpherembe of Mzimba and Traditional Authority Mukumbira of Nkhata Bay supported Karonga by reiterating that the death of Mutharika had been a surprise to Malawians, and the people will not forget the late president for the various developments he oversaw during his lifetime. Lastly, the chiefs said that they have hope in the new president – Her Excellency Madame Joyce Banda. They believe that she will continue the developments which the late President has left incomplete, and come up with various new developments. The viewing ceremony at Mzuzu State Lodge will end today. The event will proceed tomorrow in Blantyre for the people of the Southern Region to pay their last respect to the late Mutharika.